Save West Hampstead, "Stop the Blocks!" – Community campaign fighting Camden Council's proposed sell-off of publicly-owned land at 156 West End Lane. Community campaign fighting Camden Council's proposed sell-off of publicly-owned land at 156 West End Lane. 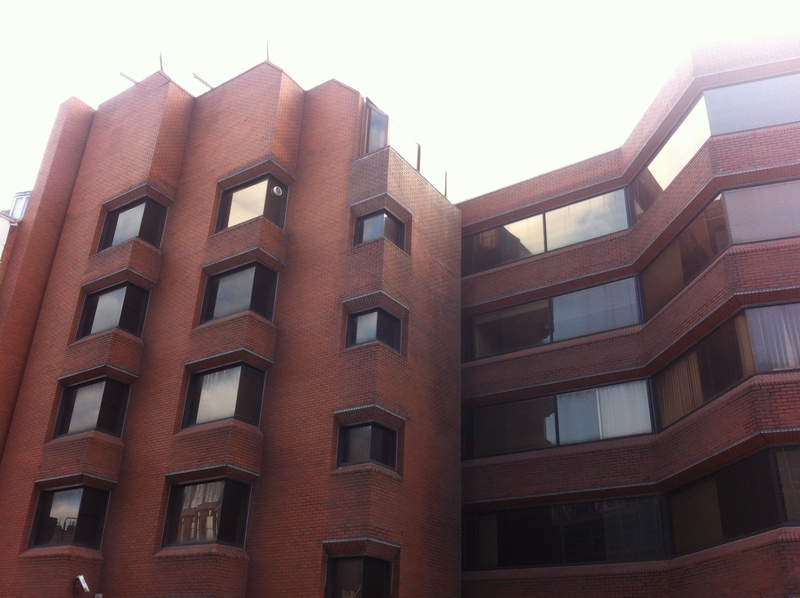 Save West Hampstead “Stop the Blocks!” is requesting that Camden Council commission a fully independent lighting study based on the proposals for 156 West End Lane. We’re asking all West Hampstead residents to join us in this call in a bid to protect the only public open space in the area. In this article we explain why a fully independent daylight and sunlight study is required. At the end of the article is a list of contacts to email and a brief template letter. Please help us save Crown Close Open Space. Such was the jaded and cynical response from a representative of A2 Dominion (A2D) when challenged by West Hampstead residents about the deep shadow that would be cast across the two children’s play areas on Crown Close by A2 Dominion’s proposals for the publicly owned land at 156 West End Lane. While it may be true that some parents might not want their children to play in the sun, it doesn’t follow that developers are automatically granted the right to remove any choice from all parents by erecting seven storey private gated blocks between people, public spaces and the sun. Nor does it grant them the right to remove from adults the choice of whether or not they too wish to maintain their access to sunlight from existing, long-standing public spaces, homes and gardens. The sun is our primary source of Vitamin D — known as “the sunshine vitamin“. Vitamin D deficiencies among the general population are increasingly well documented and reported. Recent research and government figures suggest that as much as 25% of the population suffers from a deficit of Vitamin D. The many serious health consequences that arise from a Vitamin D deficiency are so great that it has for some time been the case that Vitamin D supplements are “advised for everyone“; or at least everyone that can afford them. Meanwhile, the many health benefits of Vitamin D, including its anti-inflammatory properties and its necessity in the prevention of a recent alarming increase in rickets and ostomalacia, as well as its role in the mitigation of cancer risks, heart problems, rheumatoid arthritis and asthma amongst others. The health benefits of sunshine and its key role in maintaining adequate levels of Vitamin D place a greater burden of responsibility on developers and Council planners alike to secure for all the right to sunlight. While Vitamin D isn’t a material planning consideration itself, overshadowing by any proposed development and the resulting loss of light definitely is. Daylight is the source of all life on earth. It is fundamental to our quality of life. How we plan our buildings to ensure access to good levels of daylight is an extremely important but often overlooked part of planning. The impact of poor quality daylight on health has been known about for hundreds of years. It is a cause of disease such as rickets, which used to be common in London and many other urban centres. Because of this, legislation from the early 20th century progressively sought to improve the access to light and air by laying down rules for maximum heights of buildings, and the minimum distance they must be set apart. 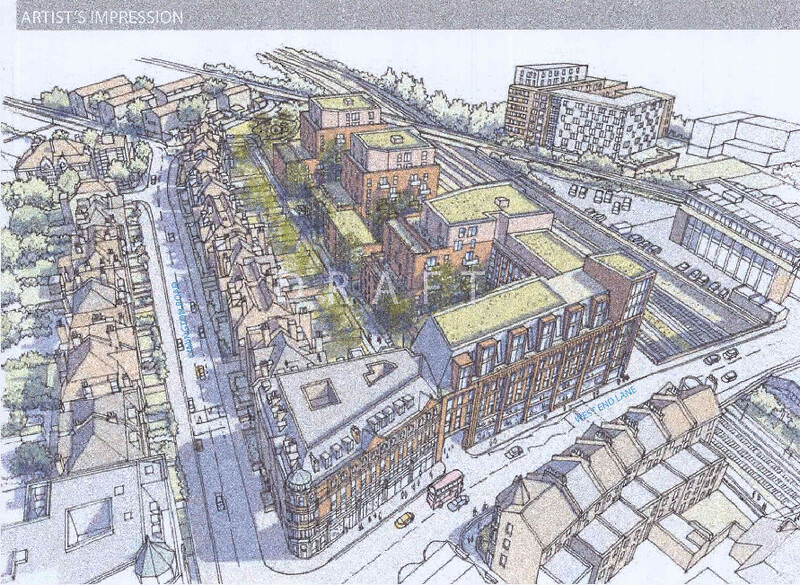 Camden Council planning documents identify West Hampstead as being “deficient” in Open Space. 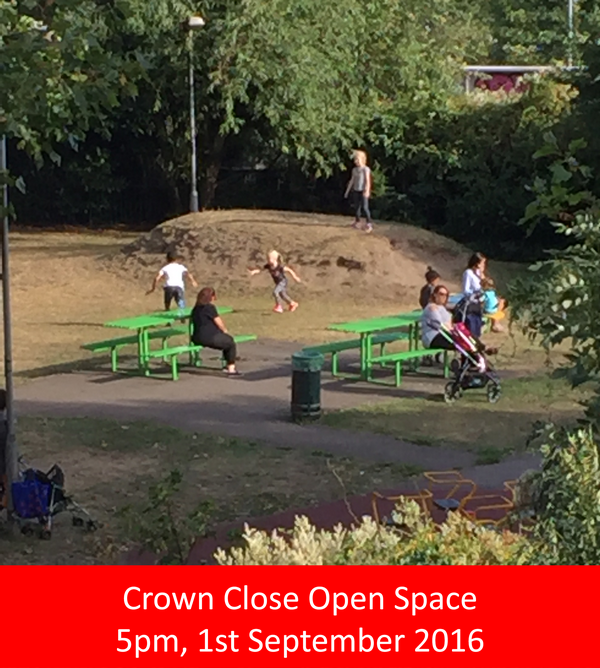 In the immediate vicinity of 156 West End Lane, there exists only the Crown Close Designated Open Space that benefits from having two heavily used public children’s play areas. The Open Space currently benefits from full daylight and sunlight, with shade offered by mature trees as the sun follows its path across the sky. In terms of amenity, I mentioned the importance of the daylight/sunlight analysis, particular for the properties along Lymington Road. In order to fully assess this situation, all of the affected properties will need to be visited and the habitable/non-habitable rooms identified prior to the report being undertaken. I accept this is an onerous task but a necessary one and I would think that once you begin the public consultation process, the vast majority of these neighbours would come along so contact could maybe be made with them in this way. Save West Hampstead “Stop the Blocks!” campaign supporters lobbied Camden Planners for comprehensive overshadowing diagrams for all times of the year, including overshadowing effects for the surrounding areas such as public spaces and residential properties. Following a long and protracted battle with A2 Dominion, predominantly via Camden Planners, a daylight/sunlight overshadowing diagram was eventually released. The overshadowing diagrams showed the damaging impact on the Crown Close Open Space and MUGA (Multi Use Games Area/Football pitch) on only March 21st, and only at two hourly intervals between 8am and 4pm. From football pitch to pitch darkness. It was clear from overshadowing diagrams that the impact would be hugely severe, especially during Spring and Autumn afternoons and evenings when children return home from school and play outside. The same applies for residents returning home from work who can often be found sitting outside enjoying the early and late evening sunshine. Little faith can be placed in the daylight and sunlight figures provided by the applicant. It is not clear what measurements and methods, or the accuracy thereof, were used to create daylight and sunlight reports. Interestingly, neither of two prominent local groups that like to portray themselves as the great defenders and protectors of West Hampstead saw fit to raise any objections to the proposals on the grounds of the damaging impact on the children’s play areas and the Crown Close Designated Open Space, in spite of their stated aims or policies claiming to protect amenity, open spaces and children’s facilities. One of these groups is West Hampstead Amenity and Transport (WHAT) which failed to make any effort to protect the ‘amenity’ contained in its title by not raising objections to the impact of overshadowing; even after a detailed Save West Hampstead “Stop the Blocks!” presentation to their committee about damaging impact of the proposal to these valuable West Hampstead amenities. In a relatively densely developed urban community, these sites have a vital role in providing an essential amenity, as well as space for exercise, relaxation and the appreciation of nature. They all have a high environmental value, are local in character, are in close proximity to the community they serve, and provide important benefits to the biodiversity of the area. They therefore fulfill the requirements set out in Paragraph 77 of the NPPF. This plan uses the additional protection afforded in the NPPF to designate [this] site as Local Green Space. After the first application was determined for a variety of reasons to be unsuitable to progress further, A2D submitted a minorly ‘revised’ proposal in June 2016. An overshadowing analysis of sorts was included for neighbouring properties for three seasons, Spring (21st March), Summer (21st June) and Winter (21st December). Note that Autumn/21st September figures are the same as Spring/March 21st figures. Once again, the diagrams only covered the time period between 8am-4pm, meaning that no overshadowing information was provided for any of the times at which the play areas and open spaces are most used most of the year. 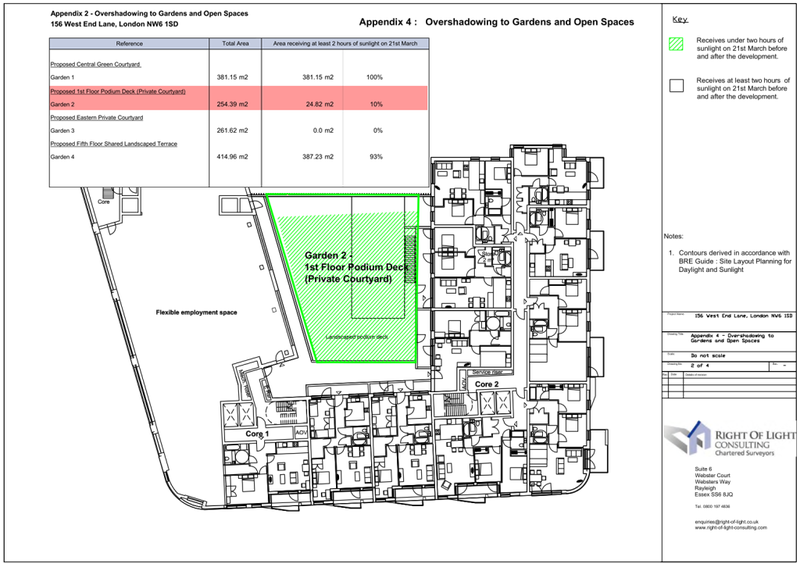 Additionally, no overshadowing diagrams for the Designated Open Space were included. This is an interesting ‘omission’, as the Designated Open Space has planning policy protections at local, borough, London and national levels. 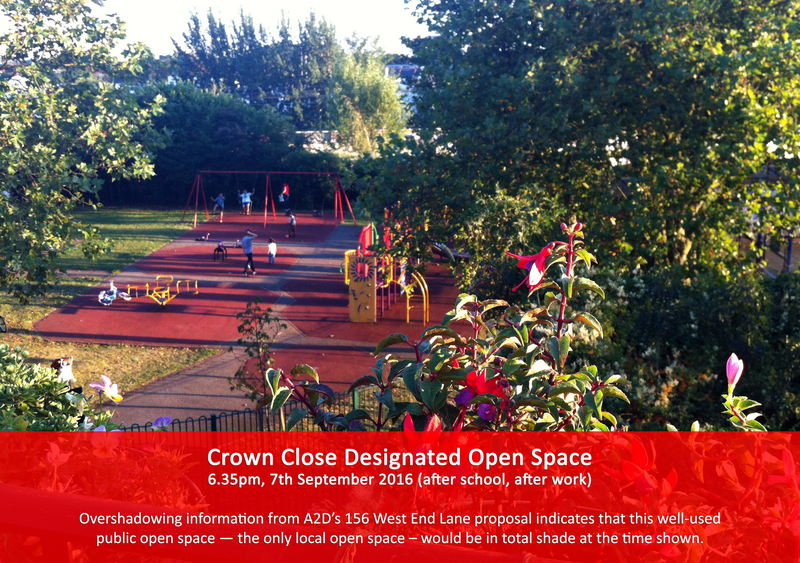 Crown Close Open Space, 6.35pm, 7th September 2016 – Overshadowing information from A2D’s 156 West End Lane proposal indicates that this well-used public open space — the only local open space – would be in total shade at the time shown. The Save West Hampstead “Stop the Blocks!” campaign immediately contacted Camden planners to request that A2D’s diagrams should show the full overshadowing impact from Sunrise to Sunset and, further, the impact during the summer months to both the Crown Close Designated Open Space and the two children’s play areas that are well used in the long evenings, as well as neighbouring properties that surround 156 West End Lane that will all at some point in every day of every year be negatively affected by overshadowing from the proposed development. A2D has not yet provided this information and so the official re-consultation period on the ‘revised’ proposal has not yet officially commenced. However, comments on and objections to the revised proposal can still be sent to Camden planners even though the official re-consultation has yet to start. In fact, most councils will accept comments on planning applications until the point at which an application is put before the planning committee. Reading through the documents in A2D’s planning application, much is made of their proposed “central courtyard”. The stark reality is that the “central courtyard” is a few square metres of space which — while pretending to be a new “public open space” — only serves to separate the “affordable” block from the private sale units. However, their approach to this and ‘open space’ within the proposed development also testifies to A2D’s equally scant regard for the amenity of children and families that would live within their proposed scheme; a demonstration of their scant regard for the amenity of current West Hampstead families. The much vaunted “central courtyard” would itself be overshadowed most of the day for most days of the year by the proposed bulky seven-storey blocks to the east and west, while a proposed ‘open space’ for private residencies (Garden 3 in the table below) is blessed with receiving zero percent sunlight at all times! Worse yet, while jeopardising the existing amenity of Crown Close, it’s Multi-Use Games Area, children’s playground and Designated Open Space, the proposals include a “podium deck” designed as the open space for families within the so-called “affordable” accommodation (Garden 2 in the image and table below). As shown by the developer’s own data, this fails to meet even the basic BRE minimum requirement of two hours of sunlight on 21st March! Destroying amenity: The June 2016 proposal from A2 Dominion includes open spaces that receive 0% sunlight and just 10% of the proposed play spaces for families in so-called “affordable” accommodation would receive the BRE minimum of two-hours sunlight. Just 10% of this space would receive the bare minimum of two hours sunlight in Spring, meaning 90% of this area for less well-off families would be in total shade and devoid of direct sunlight. As with other amenity areas it will be in almost constant shade throughout the year. Elsewhere within the development, the abject lack of light designed into the proposal is demonstrated by the over-abundance of proposed “shade tolerant planting”. Taken along with the irreparable damage that would be done to the long existing amenities at Crown Close — amenity that is precious to all families in the area and particularly those without access to their own gardens or outdoor spaces — it is abundantly clear that the proposed development would be an utter disaster for residents within the proposed development, the wider area, its people, families and children in both the short and long-term. As we have stated from the outset of the campaign, if planning policies and the upholding of planning policy has anything to do with this development, it must absolutely be refused permission. The impact on sunlight and the lack of residential amenity arises predominantly from the extremely high density of the scheme, which exceeds density guidelines outlined in the London Plan. Concerns about these issues were expressed in the GLA Stage 1 Report, as highlighted below. In the June 2016 revised proposal, further insult is added to the threat of injury by the inclusion of a sun-drenched roof terrace on the eastern block — the very block which most damages light to the existing, genuinely public open spaces. This new proposed space is claimed to be ‘shared’ in an attempt to address concerns raised by the GLA regarding lack of amenity within the proposed development. Yet no indication is given in the plans of how the roof terrace might be accessed, nor who might be allowed to access it. It is highly unlikely to be a ‘communal’ space for all residents of the proposed scheme nor the West Hampstead community that currently enjoys the existing Designated Open Space as it sits on top of the private block. Furthermore, the plans don’t show any play equipment for children, just green space and benches. Developer image of a sun-drenched seventh floor exclusive private roof terrace that would destroy the amenity of Crown Close Designated Open Space public facility and children’s play spaces. Note that the developer also seems to have cropped at least half a person out of the open space. If you can’t make it work, FAKE IT! 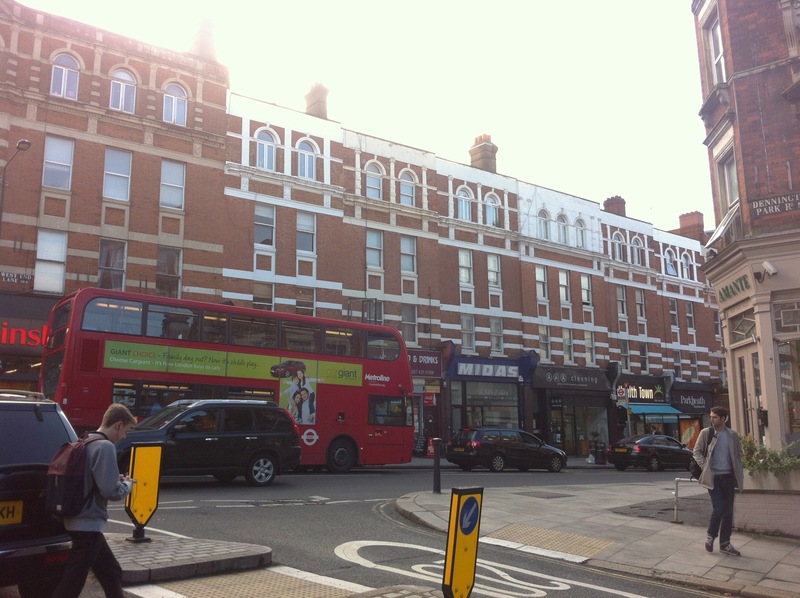 Although the Save West Hampstead “Stop the Blocks!” campaign queried the original methodology used to obtain the Sunlight/Daylight/Overshadowing figures and diagrams, what wasn’t anticipated was that figures in the ‘revised’ application would show marked reductions in the amount of sunlight available to locations that are currently overshadowed by nothing. No reason nor any explanation is given for such dramatic differences between the before development figures in the June report and those contained in the December 2015 report. What is evident is that, if the June ‘After development’ percentages were subtracted from the Nov/Dec ‘Before development’, these windows would all fall well below even BRE minimums. It is difficult to interpret this manipulation of the figures as anything other than the developers attempting to conceal the true impact on neighbouring properties and public spaces. As it stands, residents and planners have been presented with two conflicting sets of data in which no one can have any faith. Analysis differs between the two versions of the documents submitted and, significantly, the applicant has reduced the amount of light available to properties ‘Before Development’ in some of the cases where the ‘After Development’ figures would have the greatest impact and render available sunlight to below minimum BRE guidelines. While A2 Dominion may flaunt the fact that, following after their adjustment of figures, “minimum acceptable levels of daylight” have been achieved, this is a very different thing to the council’s commitment to “consider the overall loss of daylight” which in all cases for properties and public spaces alike, is substantial and unacceptable. The applicant has not provided any explanation of the methodology used to create either set of figures, nor have they explained why public spaces, homes and gardens that are not currently overshadowed by anything suddenly have a dramatic reduction in light. The entire methodology used to compile these sets of figures and the accuracy of the information provided is contentious and questionable. Furthermore, this would not be the first time that a developer had misrepresented the impact of a proposed development, as explained in a series of articles by George Turner on OurCity.London. 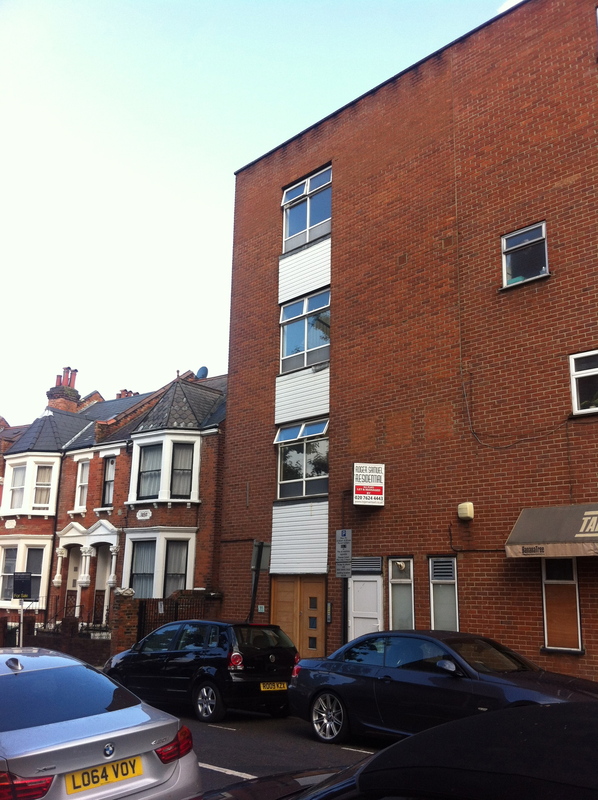 156 West End Lane is publicly owned land, with Camden Council as the custodians of that land. Save West Hampstead “Stop the Blocks!” has written to the local MP, Tulip Siddiq, our elected councillors, Camden planners and other Camden officers to request that a fully independent study is now commissioned. The grounds and justification for this are clear: No faith can be placed in the conflicting studies that have been prepared by Right of Light Consulting on behalf of A2 Dominion in support of A2 Dominion’s proposal for 156 West End Lane. Included with our request for a fully and truly independent lighting study is a comprehensive dossier of evidence outlining several examples of instances where it appears figures have been manipulated to weight daylight and sunlight studies in favour of A2 Dominion’s proposal. We urge all West Hampstead residents and supporters of the campaign to Save West Hampstead and “Stop the Blocks!” to join us in our call and reiterate the demands for a fully independent daylight and sunlight study with comprehensive Sunrise to Sunset overshadowing diagrams to be commissioned and to insist that no official public consultation on the revised application starts until such time as the facts regarding the impacts of overshadowing can be truly and honestly known by all. Below are some of the key people to contact regarding the call for Camden Council to commission a fully independent daylight and sunlight study and comprehensive Sunrise to Sunset overshadowing diagrams based on A2 Dominion’s proposals for 156 West End Lane. Please email as many of them as you can. We include a brief template email at the end of this article. To make this as easy as possible for everyone, all you need to do is click the email address of each recipient and a prefilled email with a subject line and the body text shown below will open. All you need to do then is add your name at the end and send the email. The whole process should take no more than a few minutes of your time. 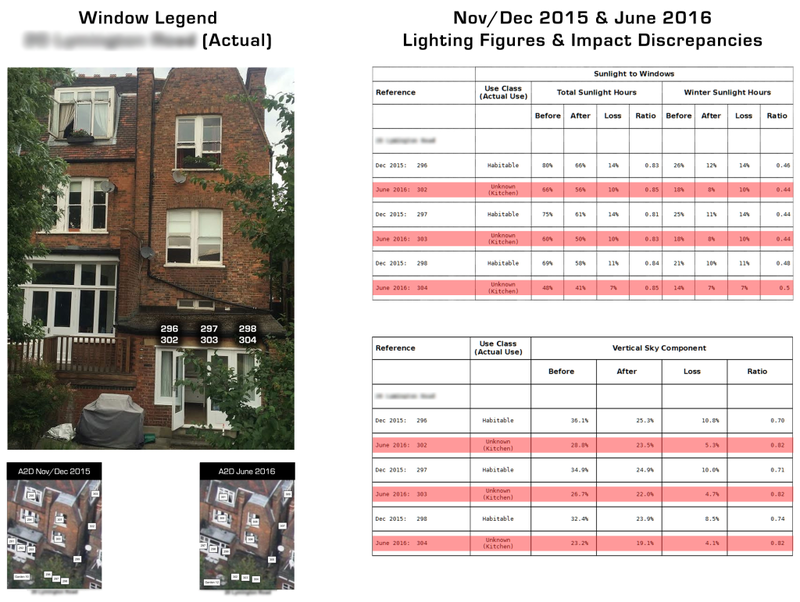 The 2015 and 2016 revised applications for the publicly owned land at 156 West End lane contain conflicting sets of daylight and sunlight data and no methodology is outlined that allows anyone to determine the means by which the figures were calculated. As such, I do not believe that any faith can be placed in either the original nor revised sets of figures. What is clear is that irreparable damage would be done to the Crown Close Open Space. I request your assistance in ensuring that Camden Council commission a fully independent Daylight and Sunlight study, complete with comprehensive Sunrise to Sunset overshadowing diagrams based on A2 Dominion’s proposals for 156 West End Lane so that it is possible to establish the true impact on neighbouring properties, public amenities and the Designated Open Space in Crown Close. I also request that you help ensure no official public consultation on Application 2015/6455/P commences until such time as this fully independent Daylight and Sunlight study is made available. To date, we have only received a response from councillor Angela Pober. Updates will be added as and when responses are received from other representatives. If you receive a reply to your queries, please feel free to forward them to SaveWestHampstead@gmail.com. We tackle the issue of private meetings between local groups and developers. In an earlier post on this blog we covered the strangely contradictory approaches of West Hampstead Amenity and Transport (WHAT) and the West Hampstead & Fortune Green Neighbourhood Development Forum (NDF) to local planning matters and the way in which both organisations seem only too happy to abandon their stated aims and policies to suit their own ends rather than the best interests of West Hampstead residents. One of the local criticisms of WHAT from some in the West Hampstead community is that WHAT is little more than a local front organisation for the Labour Party. Recent news in this regard, concerning the 156 West End Lane (156WEL) saga, comes from the minutes of a WHAT committee meeting held on 16th May 2016.
b) Item 3(d): 156 West End Lane: Virginia and Mark had met with A2Dominion, who said that they would be submitting a revised application soon. “Virginia and Mark” refer to Virginia Berridge and Mark Hutton respectively, both of whom are eminent and high-profile members of the local Labour Party. The former was the chair of WHAT for some years and resigned her post at this year’s WHAT AGM and also happens to be married to Geoff Berridge, the Chair of both the West Hampstead Branch of the Labour Party as well as the Hampstead and Kilburn Constituency. The latter is a WHAT Committee member and a key organiser of local Labour Party activities in West Hampstead. That both these prominent members of the local Labour Party would choose to hold a private meeting with A2Dominion — the organisation that is Labour controlled Camden Council’s preferred bidder in respect of the publicly owned land at 156 West End Lane that Labour Party Councillor for Finance and Technology Policy, Theo Blackwell, is looking to sell in order to fund the new council offices at 5 Pancras Square — is interesting to note, particularly in light of the fact that WHAT was the only local organisation that supported the A2Dominion proposals for 156 West End Lane in a manner quite contrary to several hundred West Hampstead residents. Noteworthy too is that, of the 500+ letters of objection submitted in response to A2Dominion’s planning application, several of the minuscule number offering support for the proposal came from — you guessed it — local Labour Party members, including none other than Geoff Berridge. Those of us who are members of both the Save West Hampstead campaign as well as WHAT have endeavoured to obtain from the WHAT committee a report on the meeting between Berridge, Hutton and A2Dominion representatives to establish exactly what was discussed but, thus far, have yet to receive a response. Readers can draw their own conclusions about the responsiveness of WHAT to developers as compared to their lack of response to WHAT members and residents of the same local community they claim so assiduously to aim to protect. All of which brings us nicely round to meetings between A2Dominion and the NDF and the way in which A2Dominion will happily meet with some local groups but not all. 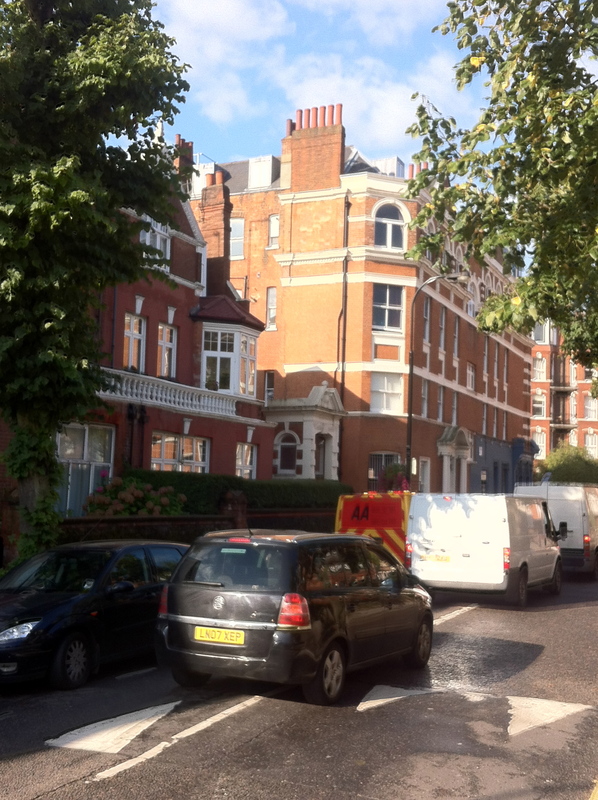 As those that have been following the story of 156 West End Lane will know, NDF committee members, including local Labour Councillor for West Hampstead, Phil Rosenberg (who also sits on the Development Control Committee), were meeting with A2Dominion back in March of 2015, some three months before A2Dominion appeared on the scene with presentations to West Hampstead residents. Since then, the NDF has had its own back-channel communications with A2Dominion and its propaganda organisation of choice, Instinctif. I’m writing to your four groups to give you an update on 156 West End Lane. I’m also copying in our local councillors. The NDF has been contacted by a representative of A2Dominion, who’s informed us that a consultation on amended plans for 156 West End Lane is due to take place in “early June”. We have not been given any details about the amendments, but we have been invited to send “two or three representatives of the NDF committee” to a presentation of the plans by the architects. We have asked for a public exhibition/meeting to discuss the amended plans, but have been told the developer does not want to do this. We have also asked if they will talk to other local groups about the amended plans, but – again – have been told the developer does not want to do this. Having discussed this, the NDF committee has decided to ask for further information before going ahead with any meeting. We have asked if the revised plans are already finalised – or whether there is a chance to suggest changes to the new scheme. We have also asked that the meeting includes a greater number of community representatives – we have suggested that they could invite a representative of each of the groups that commented on the planning application in December/January. If/when we receive a reply, we will let you know. To reiterate, we have no information about the amended plans we can share with you. As and when a new planning application is submitted we will write to all NDF members with an update. This statement was agreed with by both the Crediton Hill Residents’ Association and the West End Green Conservation Area Committee, both of which took the position that the proposed meeting solely with the NDF was nothing more than an attempt to divide local opinion and fragment community cohesion and the overwhelming opposition to the proposals. I’m writing with an update on our discussions with the developer about the possibility of a meeting to discuss the amended proposals for 156 West End Lane. We’ve established that the plans are finalised and there is no opportunity for us to suggest changes to the scheme that can be taken into account. There is also no wish on the part of the developer to involve other groups in this discussion. We’ve therefore decided not to go ahead with the proposed meeting. At the end, in its attempts to play all possible angles of leverage over West Hampstead and divide community cohesion in opposition to their proposals for 156 West End Lane, A2Dominion WAS prepared to meet with the Neighbourhood Development Forum in private, DID meet with West Hampstead Amenity and Transport’s eminent Labour Party members in private, but REFUSED to meet with the five primary groups comprised of the very West Hampstead residents that would be most directly negatively impacted by their over-development proposals. Once again, A2Dominion demonstrate that their agenda has nothing to do with the best interests of West Hampstead residents or the people whom, in their door-to-door propaganda drives of 2015, they prematurely referred to as ‘neighbours’. WHAT’s initial comments on the planning application for 156WEL abjectly failed to mention the appalling damage that would be done to the valuable Crown Close Open Space and children’s play areas while simultaneously failing to reflect the great concerns of the wider West Hampstead community they claim to represent. We urge members of WHAT to demand to know what was discussed in their name between Berridge, Hutton and A2Dominion. And given that many long-time members of WHAT have told us that WHAT’s comments on 156WEL weren’t reflective of their views on the subject, we ask WHAT members to ensure that — when the forthcoming new proposals are submitted and potentially open to re-consultation — any future WHAT submission reflects more than just the views of the Labour Party luminaries that happen to be WHAT’s leading lights, and put forward instead the many legitimate concerns of the West Hampstead community about yet more threatened over-development of the area. West Hampstead has a number of local groups and residents’ associations that are active to varying degrees. The two of particular focus here are West Hampstead Amenity and Transport (WHAT) and the Neighbourhood Development Forum (NDF). Save West Hampstead “Stop the Blocks!” gave a presentation to the WHAT committee back in October 2015 highlighting some of the many concerns of local residents and the wider West Hampstead community to the proposals for 156 West End Lane, including the devastating overshadowing impact on the one designated open space in the area. Proposed headline actions: • Work together with stakeholders to develop more detailed area planning guidance. Either through existing planning legislation such as a Master Plan, Supplementary Planning Document or through supporting stakeholders to develop a Neighbourhood Plan. A local referendum in July 2015 saw the NDP become part of Camden planning policy. The NDF has an interesting clause in its constitution — unlike most other Neighbourhood Development Forums where the purpose of the forum is to produce a Neighbourhood Development Plan, after which its work is done — and so the forum still continues in the form of a committee that holds monthly meetings and occasional workshops to “monitor” the plan, as well as hold meetings with developers, Camden Planners and various other entities. What has been woefully missing from the NDF’s approach to the challenges set by the proposed development at 156 West End Lane — in actuality the first real test of the utility and efficacy of the Neighbourhood Development Plan — is any attempt to communicate with, consult or canvas the opinions of local Residents’ Associations or residents that comprise the local community. Instead Save West Hampstead “Stop the Blocks!” has had to attend NDF meetings to convey the strength of opposition among West Hampstead residents to the proposals for 156WEL, even to the point of insisting that discussions about such a huge development do not languish at the bottom of meeting agendas. The remainder of this article is based on the comments submitted by both WHAT and the NDF to recent planning applications in the area. 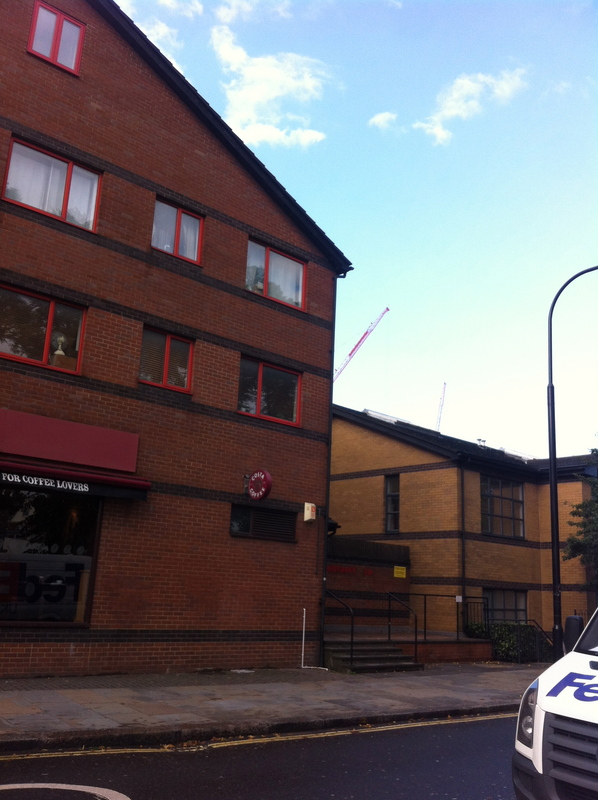 The two applications in question relate to 156 West End Lane and 11 Blackburn Road. Several months before the planning application for 156 West End Lane was submitted to Camden by a2dominion, a separate planning application was lodged for a site at 11 Blackburn Road, just across the railway lines from 156WEL. The proposal was to demolish an old warehouse adjacent to Billy Fury Way and build seven four-storey townhouses behind the former Asher House offices which have since been converted into flats. Both the NDF and WHAT submitted objections. Both WHAT and the NDF’s comments on the Blackburn Road proposal make for interesting reading, particularly when compared with the comments submitted by both groups to the proposals for 156WEL. Bear in mind that we’re comparing Blackburn Road proposals for just seven four-storey townhouses with the proposal for 156WEL for 164 units in seven storey blocks immediately adjacent to the back garden walls of Lymington Road houses that are within the West End Green Conservation Area, and that the blocks would overshadow homes and gardens and the precious designated open space and children’s play areas in Crown Close. Below we compare some of the statements in the comments of both groups. Included are the NDF’s objections to Blackburn Road proposals and their comments with regard to 156WEL, which at least they objected to in a diametrically opposite way to WHAT’s sycophantic support. 4 storeys would dominate the neighbouring houses and Asher House on Blackburn Road and not be the requisite distance from neighbouring properties to avoid overlooking. We would prefer the site to redeveloped to provide employment use only, not residential. If residential is considered appropriate, then it should be restricted to flats above the employment space. If townhouses are deemed appropriate then there should be no more than 4 of no more than 3 storeys. Members of WHAT understand the concerns of residents of the 14 houses on the South side of Lymington Road. The closest distance at 30 metres is opposite the six floor block while the 7 floor block appears to be around 32 metres away according to p.48 of the Design and Access Statement. The East Block will have a negative impact on the views from their houses which are in the West Hampstead Conservation Area. This is even after the new design has lowered the building on the northern end. That said we note that this site has been long since between allocated for intensive development under the London Plan and Camden’s Local Development Framework under successive political administrations. Members have different views on the weight to be given to the need for affordable housing against the impact on local residents in these 14 houses. So, WHAT want heights restricted to three-storeys for seven townhouses on Blackburn Road, but apparently seven storeys is acceptable immediately adjacent to Lymington Road homes inside the West End Green Conservation Area? No mention that this has nothing to do with just “views from 14 houses” (in fact, 15 houses, all of Canterbury Mansions and homes and gardens on the Crown Close Estate) but rather the dramatic and drastic effects of overshadowing which will drive many homes below the BRE minimum levels of daylight and sunlight, meaning that the blocks would cast many gardens and homes into deep shadow. Also no mention of the views into and out of the West End Green Conservation Area to which importance is given under National, Camden and NDP planning policies. When the developer behind the proposal for 156 West End Lane finally released overshadowing diagrams for the Crown Close designated open space and children’s play areas, we sent these to WHAT with the aim of eliciting comments from them on the damaging impact of the proposals on these important amenities. After all WHAT claim to care about “open space… local amenities…. children’s amenities” yet they said nothing, not a word, about the irreparable harm that would be done to these important amenities in their fawning support for the proposals. 5. The height of the new building is excessive. We consider a three-storey building would be more appropriate. We note that the documents submitted with the application fail to reflect the views from the north of the site – and make it extremely difficult to assess the impact of such a modern building (see Neighbourhood Plan Policy 2). We require that the height of the East Building is reduced to a maximum of 5 storeys (ie lower than the ‘West Building’) to ensure that this part of the scheme is policy compliant. Buildings on the West End Lane street frontage are generally five-storeys (e.g. 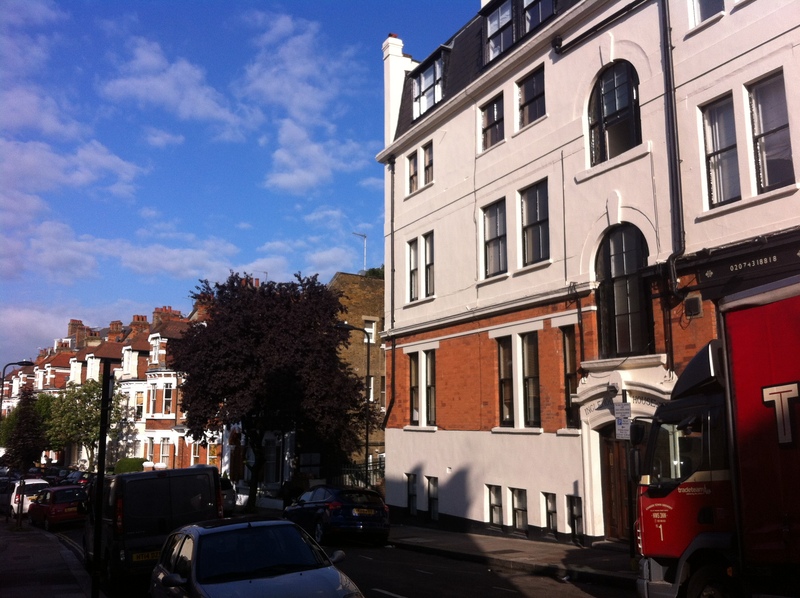 Canterbury Mansions) and Lymington Road houses are three-storeys. This transition from “high street” to “side street” is a feature of nearly all roads leading off West End Lane and particularly so within the West End Green Conservation Area. Why then does the NDF state that five storeys is acceptable? Acceptable to whom? The NDF hasn’t consulted any local residents’ associations, or indeed any local residents, prior to making this claim. No representation without legitimate, transparent consultation, thank you NDF. The NDF also fail to mention that even five-storey blocks would overshadow the Crown Close designated open space and children’s play areas, as well as damage the scene and setting of the West End Green Conservation Area. The accommodation for an additional 50 residents on the site would add pressure on local services such as schools and medical facilities which are already under provided. The applicant has exceeded the density guidelines of the London Plan by 2%, i.e. by 9 out of 457 habitable rooms. This is on the basis of providing much needed housing units because of the site’s excellent public transport links. There is concern this density may have a cumulative effect on local services in relation to the other nearby developments currently under construction which are not in the Council’s Site Allocation Plan nor in the Growth Area. However, the Department of Communities and Local Government is currently consulting on increases in density around key transport interchanges. So, 50 new residents in West Hampstead is too many and would unacceptably increase pressure on local services, but around 600 new residents at 156WEL possibly “may have” some sort of effect on local services? The duplicity, stupidity or unstated other agenda required to follow such ‘logic’ beggars belief. Worse yet, WHAT seems to be welcoming an increase in intensification and density around the West Hampstead Growth Area, so where now are their concerns for West Hampstead amenity and transport? The need for 4 storeys for a 3 bedroom dwelling suggests the individual units are too narrow to meet Camden’s space requirements with the aim of squeezing as many units as possible on a constrained site. Ironically — although we suspect the irony will be lost on some members of WHAT — the floorspace for the proposed townhouses far exceeds minimum requirements. Meanwhile, in the real world, all of the 2-bedroom 4-person ‘affordable’ units and a 3-bedroom 5-person unit (30 units of the 78) proposed for 156WEL fall below Camden’s own minimum floor-space requirements! As the development would be car-free, there would be additional pressure on out-of-hours parking on neighbouring streets. Compare this with their comments in relation to 156 West End Lane. None; not one word. No pressure on out-of-hours parking in neighbouring streets from 600 proposed new residents? How strange. 6. Road access: We welcome the removal of the unsafe lorry exit from the Travis Perkins site on to West End Lane. However, some committee members have expressed concern that the replacement exit on the northern end of the West block will also cause problems for pedestrians, even though vehicle movements will be much lower in number. It has been suggested that some form of traffic lights or barrier could be installed. The statement regarding the proposed new access road suggests a blatant disregard for the safety and amenity of the hundreds of residents who use the already heavily-congested pavements every day. Strangely, the NDF had nothing at all to say on the proposed relocation of the site access road. When challenged for an explanation as to why they failed to pick up on one of the primary concerns of and dangers to West Hampstead residents from the proposals, the excuse given was that a hastily put together counter proposal worked on by Policy Exchange’s Create Streets on behalf of the NDF also featured a dangerous concealed access road located at the north of the site. Thankfully, many hundreds of West Hampstead residents have told Camden in no uncertain terms that the proposals for 156 West End Lane are totally unacceptable. If WHAT and the NDF wish to retain any sort of credibility as entities that purport to represent the interests of West Hampstead residents, they need to consult with, engage, listen to and actually represent the views and sentiments of the people who live here. Save West Hampstead “Stop the Blocks!” have taken up the debate with WHAT in the local press however, to date, we have been unsuccessful at eliciting legitimate replies. Furthermore, WHAT’s responses have carefully avoided answering the questions posed in favour of championing WHAT’s long history and attacking us for endeavouring to hold them to account. Links and screenshots of the debate so far are included below. 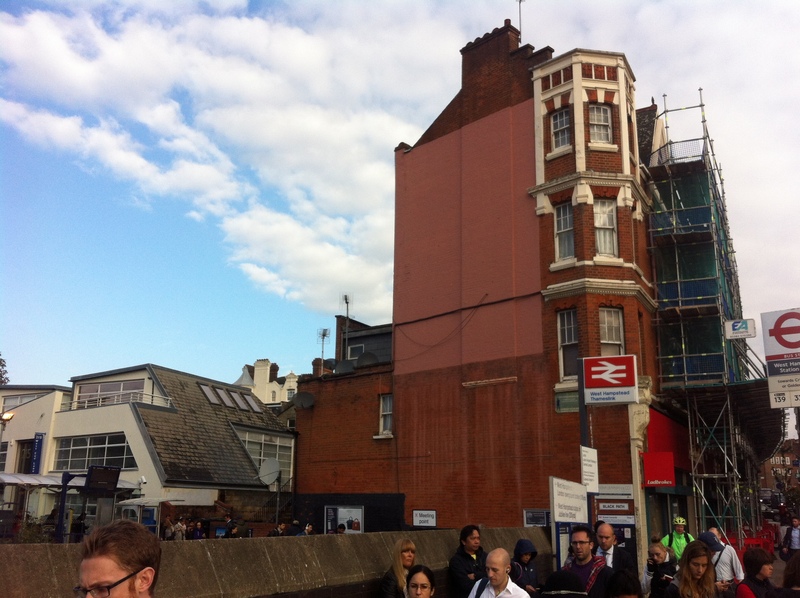 CNJ – SWHSTB Opening Letter (11 February, 2016): Why does West Hampstead Amenity & Transport not oppose a seven-storey block? A similar debate has taken place in the Hampstead & Highgate Express — complete with WHAT’s consistent failure to answer the questions — and you can see screenshots on the Media Coverage page of the main website or follow the links below to the E-Edition of the Hampstead and Highgate Express. Author Save West Hampstead, "Stop the Blocks! "Posted on March 1, 2016 June 12, 2016 Categories 156 West End Lane, Save West Hampstead, Stop the Blocks!Tags #156WEL #StopTheBlocks #SaveWHamp, 156 West End Lane, Amenities, Amenity, Blackburn Road, Letters, NDF, Neighbourhood Development Forum, Neighbourhood Development Plan, Overdevelopment, West Hampstead Amenity & Transport, WHAT1 Comment on W.H.A.T. the N.D.F***? I have followed the development of these proposals for the site at 156 West End Lane with interest. I find the side-by-side comparison with Canterbury Mansions thoroughly disheartening. That your design team can draw inspiration from such an elegant and sophisticated building to produce something uglier and blander than the building currently on the site is an architectural achievement not soon surpassed. At least the eyesore that currently stands there has the conviction to embrace a style. That you tout a prominent corner feature as a design goal, and offer a cube shaped exhaust vent as your proposal would be hilarious if it weren’t your intention to build it in my neighbourhood. In the side-by-side analysis of the elevations you also leave off the profile of an entire floor of your proposed design. Will you build that extra floor? Why leave it off, as if somehow, being light beige, it might sneak by unnoticed? The only nod to the character of the existing architecture seems to begin and end with what can be produced with the barest minimum change to the materials cost and with zero impact on maximum gross internal floor space. Consequently, the proposed new facade looms over the pavement like a giant orange-brick boil, heaving at its seams to burst. I should not like to be waiting for the 328 if it should pop. Furthermore, this feeble attempt to match the character of the neighbourhood architecture is then wholly abandoned for the remainder of the lego block design. I note you have chosen the top of the chimney pots and a decorative mast as the benchmark for matching the height of your development to the neighbouring building. Why stop there? You commit the same sin in the side elevation, preserving the roofline to the eastern edge of the development, taking no heed of the fact that the grade has dropped nearly a full storey here. This has the effect of adding a storey to the height of the third and fourth Private Sale Towers relative to the local landscape. The site shall provide an improved design relationship to the adjoining Canterbury Mansions and West End Green Conservation Area, to protect and enhance the character and appearance of the area. Therefore, the height of any new development should ensure the overall design and transition in massing achieves an appropriate relationship with neighbouring properties – and it can be demonstrated that no harm is caused to the character and appearance of the Conservation Area, its setting. You most assuredly have two agendas and two design goals to meet. One massive Eight Storey size does not fit all. You have a High Street Development, which extends the entire Western edge of the property and extends Eastward to roughly the end of the existing five storey building. I shall repeat… existing five storey building so that perhaps you may take note that the building being replaced is five storeys tall, not six, or seven and certainly not eight. Behind this, where unsurprisingly the existing development drops substantially in height, you will have a residential site. Where and how this transition occurs may be a matter of discussion, but to proceed as though the entire Southern frontage on Potteries Path is a High Street is to completely misunderstand what such a thing is. I attach a selection of views of neighbouring roads that clearly show what the accepted transition from High Street to side street looks like. (Fig. 6-14) As it happens, I love the proposed name of your new side street: Shared Surface. It evokes history, community and the village feel that West Hampstead is striving to protect. You may well note, that on all the other side streets (or shared surfaces if you prefer) in and around West Hampstead the homes are three storeys high. You may find the odd exception, stretching skyward to four storeys, but by and large the acceptable height of homes on the residential roads of West Hampstead is pretty well fixed. Of course it is a different matter when Mansion Blocks occupy the entirety of city blocks, but this is not the circumstance of the site at 156 West End Lane. In fact, this site is adjoined to the north, quite closely I might add, by a considerable number of houses that contain a surprising number of residents. Residents who have no desire to have their homes plunged into the shadow of your eight storey monoliths. Citizens who do not want their wonderful sunny southern views to be consumed wholly and completely by a view of the back of your proposed orange Tower Blocks. Your document describes these houses as Villas, bringing to mind the predominantly vacant summer homes of Emperors. Perhaps this language is designed to be inviting to a certain demographic you may be targeting for the “private sale” units, who will be buying off plan from distant countries without any ambition to become our neighbours. Those absentee buyers may be the reason that you project a mere 209 employed residents in 191 units. Make no mistake however, these are houses on Lymington Road not Villas, lived in by your neighbours and you are proposing to radically diminish the benefit they can enjoy from their homes. You could not have got it more wrong really. I haven’t measured my own house, but as the heights offered in the current set of proposals are measured from grade at the pavement on West End Lane (e.g. buildings labelled +25 metres and +21 metres are in fact the same height) I can say the houses are around +9m. In other words: You propose to build homes that are MORE THAN TWO TIMES TOO TALL. Put another way, you are asking for more than DOUBLE what is the established norm. Our neighbourhood is not a buffet where you can gorge yourself on a double helping of pudding. Most sad of all, the solution to overcoming these simple objections are staring you in the face. Your neighbours. A word you’ve used on occasion. Canterbury Mansions is a terrific model of a successful mixed-use building housing five businesses and boasting some 17 residential units in a footprint substantially smaller than the existing former Camden offices at 156 West End Lane. Immediately to the north of the proposed site, Lymington Road provides a somewhat crude but straightforward blueprint of how to put 50+ residential units on a parcel of land similar in all dimensions to the residential portion of the site you hope to purchase. Naturally, purpose built structures would certainly improve the efficiency of the delivery of this housing, offering substantially more living space per square meter than period conversions, without over-reaching on the elevations. With some creativity, you might be able to put 70 or more units on the land that backs on to Lymington Road without eclipsing 9+ metres (or eclipsing the existing homes and residents). Case in point, there is a sizeable affordable housing development built by Camden itself that is your third neighbour (the soccer pitch and playground you propose to cast into shade for nine months of the year are part of that very same development). You will note that they have built a variety of unit sizes with significant density while keeping the height of the homes in line with the homes in the rest of the neighbourhood (see Fig. 17). I would welcome a proposal from A2Dominion to develop the site in keeping with the established norms of the neighbourhood (the adjoining conservation area). I note also with interest your recent invitation to the presentation on September 10th and 12th touted A2Dominion as a charity. Now that I have looked more closely at your corporate structure, I am curious to know something. Will the not-for-profit arm (A2Dominion Homes Ltd) be the only division of A2Dominion involved in the development of the site? It seemed from this last correspondence that the project was a not-for-profit venture. I can only assume that this is the case. It would be unseemly for one to hint that were so, only for it to be discovered that this represents just one aspect of the development and the profit motive behind the project was obscured by the use of this reference. Perhaps unethical might be a more accurate term for this type of obfuscation. I assume for instance that the holders of A2Dominion Bonds will be expecting their nearly £14,000,000.00 in pay outs this year and wonder how this is achieved in isolation from the business of building non-profit affordable housing. Perhaps you could provide a broad strokes outline of the corporate structure behind the proposed development and their respective roles. This would help avoid any further confusion (deliberate or otherwise) surrounding who the real beneficiaries of this development are. As you’ve seen fit to share a cocktail napkin cross section of your proposal, here’s some back of the envelope math to consider. 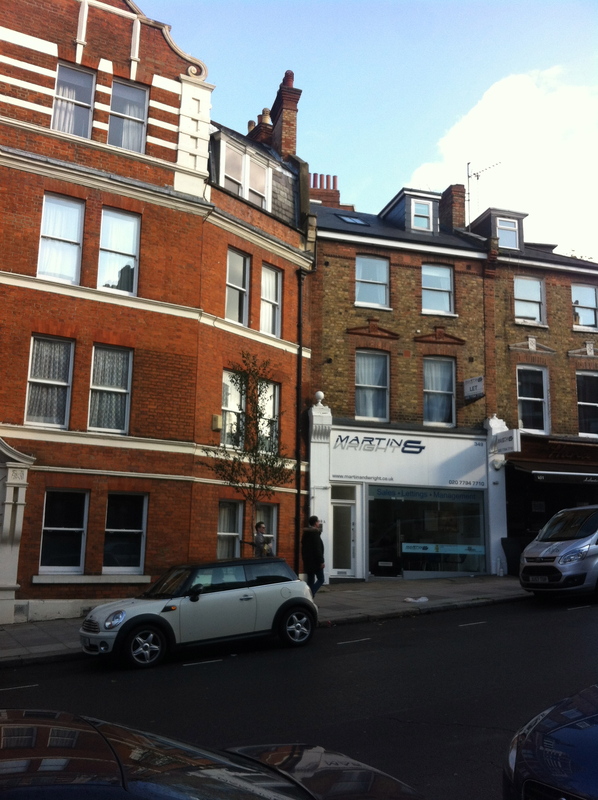 West Hampstead real estate has surpassed £8,500/sqm. The site at 156 West End Lane is 6,000 sqm. If you built on the site, that represents a one storey building worth £51,000,000. Subtract the land costs of £20,000,000 and a reasonable £1000/sqm building costs and you’re left with £25,000,000. Surely that’s enough to pay for the demolition, the salaries of the hardworking types at A2Dominion (and their PR firms) and any other pay outs (totalling £ 19,000,000), leaving an additional £6,000,000.00 untouched to build a second storey of affordable housing (Camden’s 50% target), already bought and paid for. Of course this is an oversimplification. Who would want to consume the whole footprint of the site for example? And there’s revenue generating retail space to consider. Equally, a proposal that sought five (even six!) storeys of High Street development and three storeys of residential housing, with ample room for open space and “shared surfaces” would certainly produce a much higher gross internal area and would meet the many disparate agendas of the stakeholders with minimal resistance. Save perhaps for the A2Dominion shareholders and bondholders, but we’ve previously established this is a non-profit venture. Correct? Finally, as the site is designated as an Archaeological Priority Area, what steps does A2Dominion propose to take in the demolition, site clearing and excavation of the site? Could you please detail these for me? I see you have a designated Archaeology consultant, but what real steps will be taken? I look forward to a point by point reply to these views. I also look forward to seeing them duly considered in the next round of presentations. Please expect that I will vigorously oppose your planning application should it fail to address my concerns and the concerns of other Camden residents. P.S. I include for your benefit some relevant sections of the various planning guidance your next proposal needs to adhere to. No doubt these are well known to you. I have bolded some of the most relevant sections as well as those which are referred to above. The Council will ensure that new development will preserve and enhance nearby built heritage assets (Policy CS14 and DP25). If redeveloped the existing relationship of new development immediately adjoining Canterbury Mansions to the north should be considerably more sympathetic in terms of scale, height and design with an appropriate transition in massing towards the south and east of the site. Development should relate appropriately to open spaces and not be detrimental to its function or ecological value. Development which positively interfaces with the street and streetscape in which it is located. Development which maintains the positive contributions to character of existing buildings and structures. Development which is human in scale, in order to maintain and create a positive relationship between buildings and street level activity. Development which has regard to the form, function, structure and heritage of its context – including the scale, mass, orientation, pattern and grain of surrounding buildings, streets and spaces. A presumption in favour of a colour palate which reflects, or is in harmony with, the materials of its context. New buildings and extensions that respect and are sensitive to the height of existing buildings in their vicinity and setting. Tall buildings in the Growth Area will need to have regard to their impact on the setting of the two immediately adjacent conservation areas, in order to avoid any negative impact on them. A9. The NPPF (60) states that it is “proper to seek to promote or reinforce local distinctiveness” and says (58) that development shall “respond to local character and history, and reflect the identity of local surroundings and materials”. As outlined in 2.2 & 2.5 many parts of Fortune Green and West Hampstead have a clear architectural heritage – with an attractive character and a distinct local identity. These positive features are strongly supported (as set out in the Consultation Statement) and need to be protected and preserved. New developments in such areas – particularly terraced streets – need to be sensitive to the defining characteristics of the local area in terms of their proportion, height, scale, massing, materials, storey height and rooflines. Larger developments, while reflecting new design, need to incorporate design features that reflect the character of existing development, using materials (such as red brick) which complement existing buildings. Innovation is not ruled out, however schemes incorporating innovation will need to make a persuasive case for such development and demonstrate the suitability of such schemes. A10. The height of existing development in Fortune Green and West Hampstead makes a significant contribution to the overall character of the Area. The NPPF (59) recognises height as an important consideration and that design policies “…should concentrate on guiding the overall scale, density, massing, height, landscape, layout, materials and access of new development in relation to neighbouring buildings and the local area more generally”. Much of the Neighbourhood Plan Area consists of terraced housing, which is normally two or three storeys high. Mansion blocks tend to be four, five or six storeys in height. New buildings and development will need to be based on a human scale and efficiently use the site area. High density developments are not ruled out, and it is noted (see recent reports on ‘Mid-Rise Housing’ from the Prince’s Foundation and other groups) that high densities can be achieved through high quality design, without the need for tall buildings. In order to promote and reinforce the distinct and widely appreciated local character of Fortune Green and West Hampstead, new development shall respect, and be sensitive to, the height of existing buildings in their vicinity and setting. The design of any new building will need to reflect the design of neighbouring buildings and the neighbouring Conservation Area (see Policies 2 & 3), including use of red brick. • The site shall provide an improved design relationship to the adjoining Canterbury Mansions and West End Green Conservation Area, to protect and enhance the character and appearance of the area. Therefore, the height of any new development should ensure the overall design and transition in massing achieves an appropriate relationship with neighbouring properties – and it can be demonstrated that no harm is caused to the character and appearance of the Conservation Area, its setting. Fig. 1 – We can see that the height of the buildings were increased to 9 storeys for the June presentations. Note also the change in grade that makes the two private sale blocks one storey taller than the affordable rented block. Fig. 2 – Throughout the neighbourhood, rooflines descend to follow the contours of the ground. Fig. 3 – Here again we see the roofline in step with the slope of the hill. Fig. 4 – Where grade drops one storey, the roofline matches. Fig. 5 – Though difficult to see from street level because of the interesting geometry of the building, the vacant Camden Offices at 156 West End Lane are taller to the north, with the roofline dropping in harmony with the slope of the street. Fig. 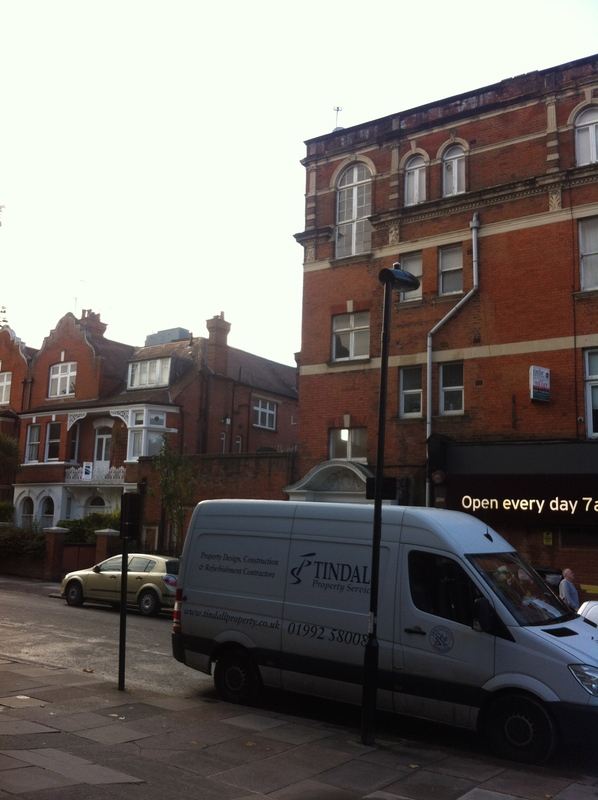 6 – This view could not be more illustrative of what is permitted in West Hampstead. The photo was taken directly across the street from the proposed development site. On the right, an imposing (yet elegant) High Street building, behind it on a footpath (not Potteries path but a footpath along the rail line) a NEWER development has been built. Note the height of the white building on the left. There could not be a more precise duplication of the circumstances at 156 West End Lane. It is mere steps away from the site and bears the identical relationship to the High Street, the rail-side path and residential neighbours to the north. Note also the busy pavements, still surprisingly crowded in the morning even after rush hour and the school run when this photo was taken. 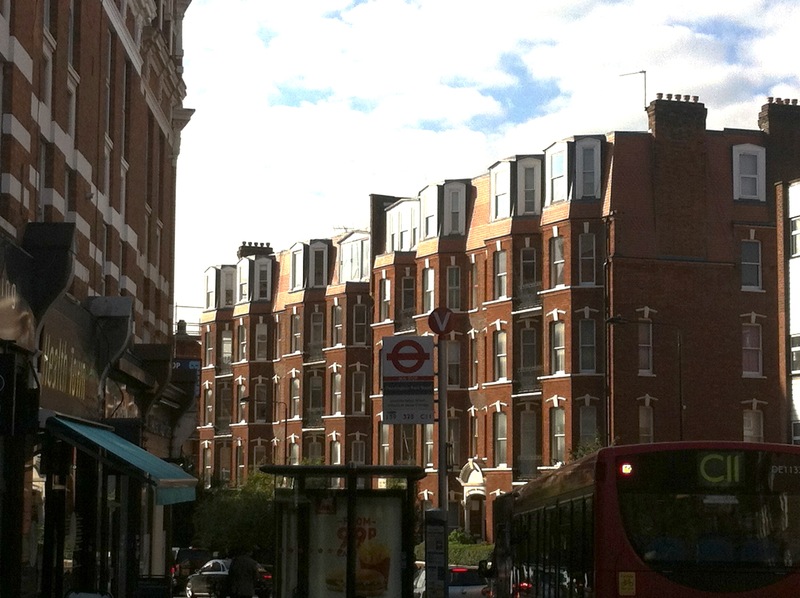 Fig.7 – The impressive buildings on the High Street give way to the more human scale of the residential side streets of West Hampstead. Fig. 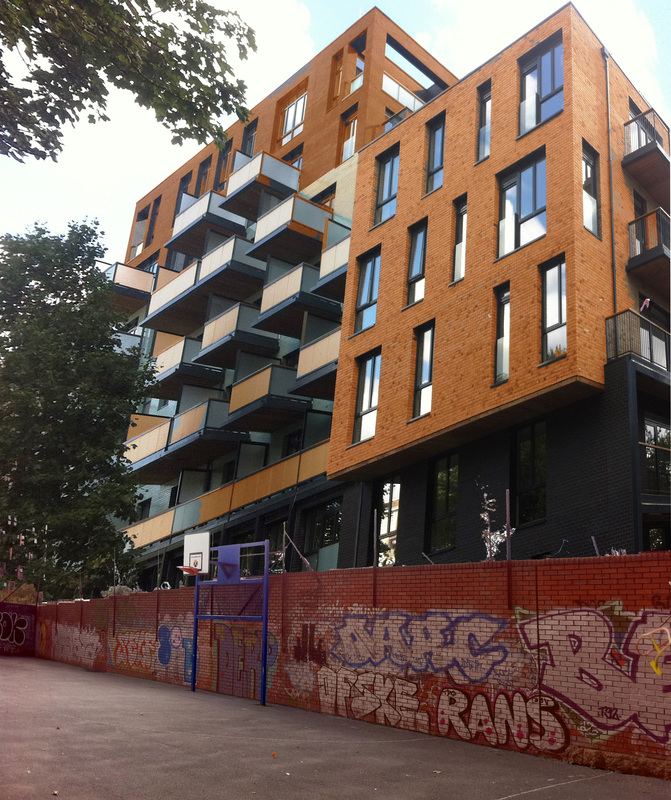 8 & 9 – Newer developments observe the established appropriate relationship with neighbouring properties. Note the differing heights from High Street to side street. Fig. 8 – Newer developments observe the established appropriate relationship with neighbouring properties. Note the differing heights from High Street to side street. Fig. 9 – Newer developments observe the established appropriate relationship with neighbouring properties. Note the differing heights from High Street to side street. Fig. 10 & 11 – Buildings on the High Street are afforded considerably more height than those on the side streets. 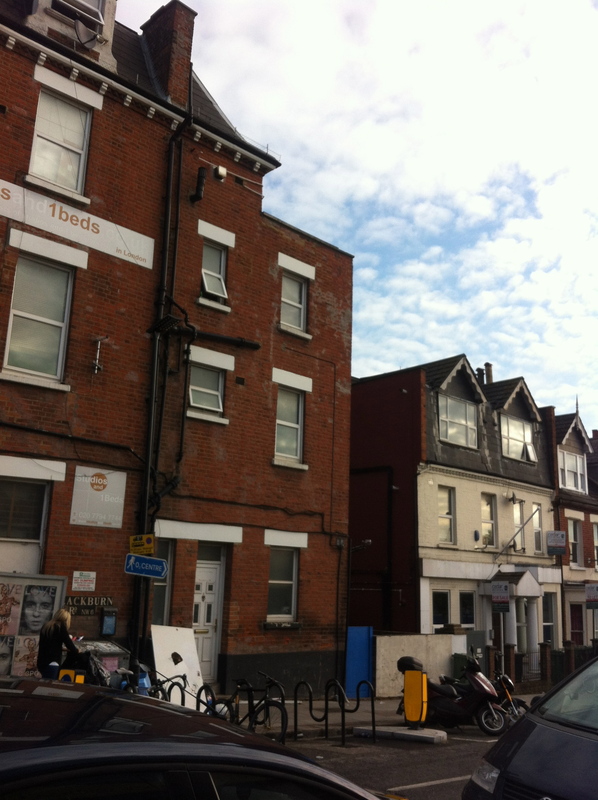 Once we move a few steps from West End Lane (the High Street) we can see residential structures are 3 storeys high. Fig. 10 – Buildings on the High Street are afforded considerably more height than those on the side streets. 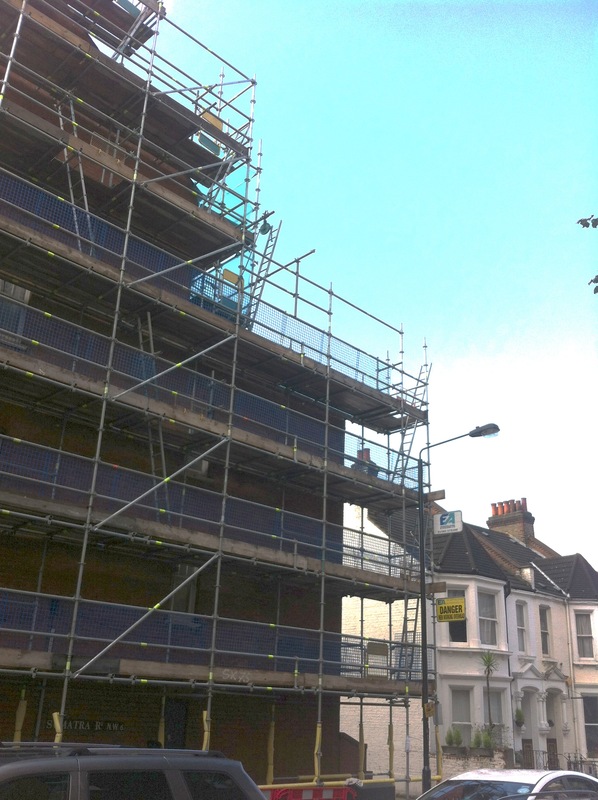 Once we move a few steps from West End Lane (the High Street) we can see residential structures are 3 storeys high. Fig. 11 – Buildings on the High Street are afforded considerably more height than those on the side streets. Once we move a few steps from West End Lane (the High Street) we can see residential structures are 3 storeys high. Fig. 12a & 12b – Yet more examples of what is the case throughout the neighbourhood. Fig. 12a – Yet more examples of what is the case throughout the neighbourhood. Fig. 12b – Yet more examples of what is the case throughout the neighbourhood. Fig. 13 & 14 – As though more examples might be required, here again we see how the mass and height of buildings in West Hampstead change from High Street to side street. This is by no means an exhaustive examination of the subject. There are many, many more such examples at the intersection of West End Lane and each and every residential street. Take a short walk around the neighbourhood and you’ll see nothing else. Fig. 13 – As though more examples might be required, here again we see how the mass and height of buildings in West Hampstead change from High Street to side street. This is by no means an exhaustive examination of the subject. There are many, many more such examples at the intersection of West End Lane and each and every residential street. Take a short walk around the neighbourhood and you’ll see nothing else. Fig. 14 – As though more examples might be required, here again we see how the mass and height of buildings in West Hampstead change from High Street to side street. This is by no means an exhaustive examination of the subject. There are many, many more such examples at the intersection of West End Lane and each and every residential street. Take a short walk around the neighbourhood and you’ll see nothing else. Fig. 15 – The Proposed development makes no “transition” to the south and east of the site. Inappropriate. Fig. 16 – The Proposed overdevelopment will obliterate the views from the existing homes on Lymington Road. Fig. 16 – The Proposed overdevelopment will obliterate the views from the exiting homes on Lymington Road. Fig. 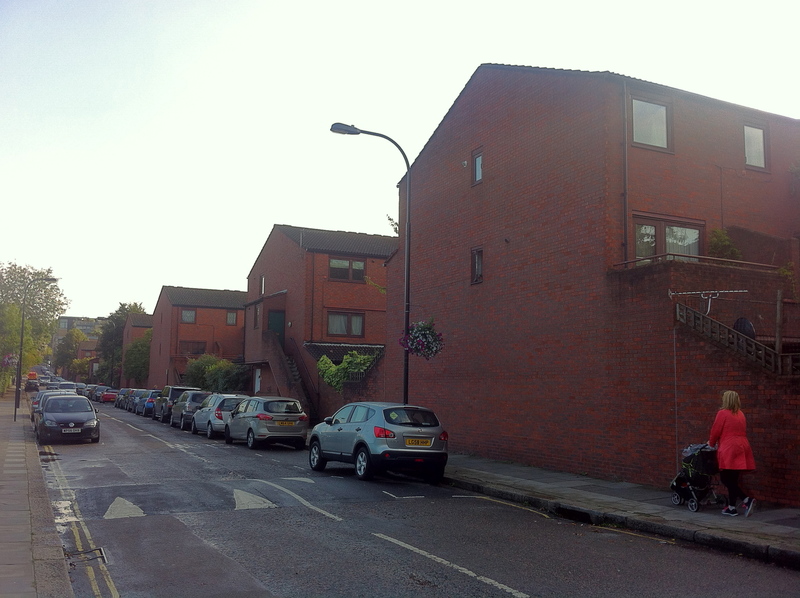 17 – The Camden council housing on Lymington Road achieves higher density while observing an “appropriate” scale and massing. Fig. 18 – A composite of what the site might look like from the Crown Close open space. The eight storey Private sale block which towers above will cast the football pitch and playground into shade after school every day for nine months of the year. Save West Hampstead “Stop the Blocks!” held a fantastic community meeting at the Lymington Road Residents’ Association Hall last night, Tuesday 8th September. The meeting was well-attended (another standing room only affair!) and we were thrilled to see plenty of regular and new faces from the West Hampstead community, demonstrating how great concerns are about forced over-development of the area with projects that do not meet actual housing needs. It was also wonderful to have present at the meeting key organisers from other local campaigns against unwanted developments across Camden including the Combined Residents Associations of South Hampstead (CRASH), Save Swiss Cottage, and West Hampstead Gardens & Residents Association. Journalists from the Camden New Journal and the Ham & High were present to cover the meeting. The meeting was chaired by Neil Fletcher, ex-Deputy Leader of Camden Council and the evening started with an update from the Save West Hampstead “Stop the Blocks!” campaign. For those that were unable to attend, a brief summary of updates is included at the end of this article. Next up was George Turner of Reclaim London, The Battle for Waterloo and the 8 Albert Embankment challenge who gave a fascinating talk about the trials and tribulations of taking on rapacious developers. He provided a wealth of useful information about challenging inappropriate and unwanted developments that don’t meet the housing needs of local communities, and highlighted the importance of Conservation Areas and heritage assets. George also explained how the proliferation of blocks and high-rise ‘luxury’ developments is, at its core, little more than a drive by developers to maximise on the volume of floor-space that can be sold, usually off-plan, to investors who care nothing for amenity, public services or the local communities but rather about the value of their international investments in safety-deposit boxes in the sky. George took and responded to questions from the floor in which he made the very pertinent point that, just because someone is claimed to be an ‘expert’ in their field, doesn’t mean that what they say can be taken at face value and, often, information is selectively presented to support an a priori conclusion. He also made the point that the best experts on the subject of any local area are the residents themselves, not drop-in developers that frame everything within the context of their intended development objectives. We would encourage everyone to attend these presentations and to be vocal about their objections to yet another proposed development of blocks in West Hampstead that threatens the amenity of all residents while delivering no tangible benefits to the community. The point was made that Camden Council have willingly derogated their duties on the provision of housing that meets the needs of ordinary people across multiple sites in Camden, preferring instead to accept the ‘legalised bribery’ of Section 106 monies. However, despite collecting considerable monies from S106 payments, West Hampstead residents are facing the possible closure of the only remaining library in the area (prior to foisting a Library Heights development on the neighbourhood?) as well as reductions in the levels of public services provided and funded by the council. The question remains: Exactly what are the supposed benefits to local residents of forced, over-intensive over-development of the area? The campaign to Save West Hampstead Library, by attending the meeting at the library on Thursday 10th September at 7.30pm. The Monday 14th September meeting of the Neighbourhood Development Forum which takes place at 7.30pm in West Hampstead Library and at which Phil Jones, Cabinet Member for Regeneration, Transport & Planning, will be speaking. Our previous standing-room only meeting was held on 14th July. A week later, on 21st July, Lymington Road south-side residents whose homes immediately adjoin the 156 West End Lane site were invited to another presentation by PR firm Instinctif. We were shocked to discover that the number of storeys proposed had increased to 4, 7 and 9 storeys through the addition of a deceptively named “lower-ground” floor situated above-ground. No significant alterations had been made to the proposals to reflect the many objections submitted, so the use of the term ‘consultations’ is highly questionable, given that any true consultation is a two-way process. On Sunday evening a meeting was held between local residents and our three local councillors, Angela Pober, Phil Rosenberg and James Yarde. There was a general ignorance among councillors about how the planning process is proceeding and the councillors stated that A2Dominion was not engaged in pre-planning meetings with council planners. Since then, Save West Hampstead “Stop the Blocks!” has provided the councillors with clear evidence that council planners are indeed meeting with the developers. This information was contained in a communication from Camden’s Director of Culture and Environment, Ed Watson, that was passed to us by our local MP Tulip Siddiq. This provides further evidence – as if it were needed – that Camden Council as the owners of the land, Camden Council as the brokers of the land, Camden Council as the planning authority, Camden Council working closely with Camden Council’s ‘preferred bidder’, and Camden Council as the beneficiaries of any monies received for the sale of the land cannot possibly act independently, impartially and honestly in any decision making process. West Hampstead residents, whose amenity will be negatively impacted by a proposed development of the scale, mass, bulk and height proposed by A2Dominion are now just two exhibitions away from the developer’s stated time-line that includes a planning application submission in November that could seal the fate of 156 West End Lane for evermore. It has been mooted that a Development Management Forum will be organised by Camden Council, however we have not received any further details about when this process will commence. This means that now is the time to step-up the campaign to Stop the Blocks. 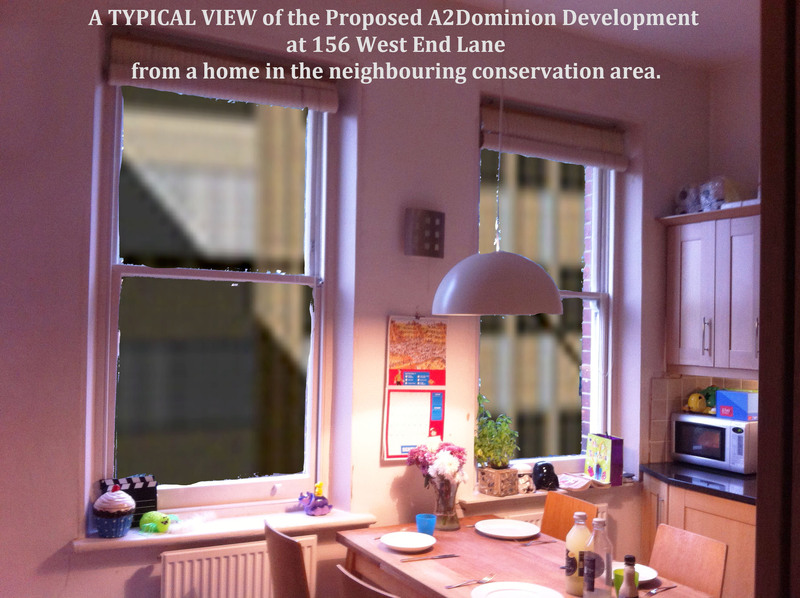 If A2Dominion determine that the well-supported and growing public opposition to their proposals in tandem with the need to comply with Camden Council’s planning regulations, and the planning restrictions imposed by building on the perimeter of the cherished West End Green Conservation Area are not sufficient obstacles for them to walk away from the project before it is too late and they do submit a planning application, we may need to commission the services of planning professionals to lodge a successful challenge. We will of course be ready to cross that bridge should we come to it. We’ll be holding a short news and updates meeting in the LRRA hall at 7pm on 8th September in advance of the two forthcoming presentations from A2Dominion/Instinctif. We’re really excited to announce that writer and campaigner George Turner will be giving a short talk based around his experiences challenging developments. This will help inform residents in the run up to A2 Dominion’s planned planning application, which is when formal objections will need to be lodged with Camden planners. We also hope to have a member of the Save Swiss Cottage group to inform us about the progress of their campaign. We’ll also be providing updates from the Save West Hampstead campaign, highlighting some of the many ways in which the proposals are counter to Camden’s own planning regulations as well as being damaging to local conservation areas. We will also be requesting a little bit of assistance from everyone that lives, works or plays in West Hampstead to help in the fight to “Stop the Blocks!” at 156 West End Lane. Another round of presentations is fast approaching at which A2Dominion and their PR firm Instinctif will attempt to sell West Hampstead residents four blocks and 200 units at 156 West End Lane. They have totally ignored the many objections sent in by residents following the first exhibition in June. 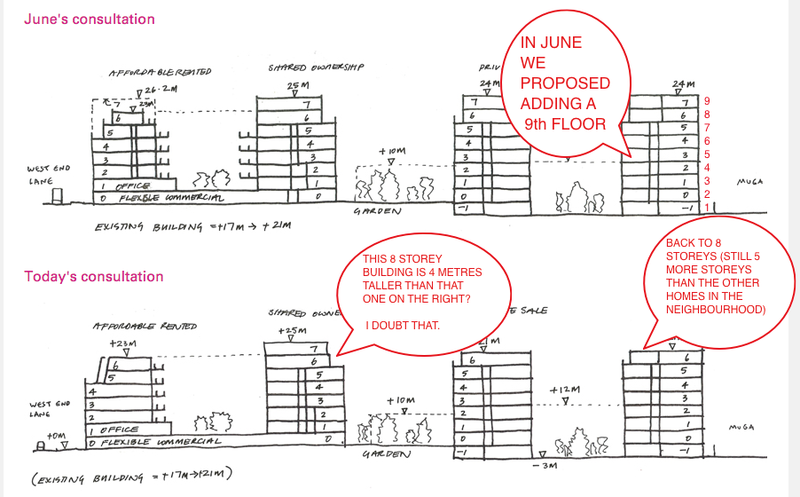 On 21st July, south-side Lymington Road residents were presented with the latest proposals for 4, 7 and 9 storey blocks, with heights and bulk increased through the disingenuous addition of an above-ground ‘lower ground’ floor. Despite presenting these drawings only to Lymington Road south-side residents, it is abundantly clear that crowbarring-in approximately 200 units and many hundreds of residents into an area with such a small footprint will have a hugely negative impact on West Hampstead amenities. Neil Fletcher’s article reproduced below was originally published in the Camden New Journal on Thursday 6th August, 2015. Neil Fletcher was elected to Camden Council in 1978 along with Ken Livingstone. He served as Deputy Leader of the Council from 1982 to 1984. From 1979 he was chosen as Camden’s delegate to the Inner London Education Authority. It is July 2035. I am wandering up Fortune Green Road with my great-grand-daughter. The sun is shining and reflecting off the shutters on the 50 or 60 blocks of apartments down the hill in West Hampstead. Queues of smart cars are crawling down to West End Lane, passing a massive tower block called Library Heights (in recognition of the council library that was sold off in 2016) and casts its shadow over the shoppers, while residents can see the Manhattan-style spread of sky-scrapers half a mile away marking the oh-so-fashionable Harrods Square at the back of the O2 Centre. After parking in the massive underground car park they will be free to enjoy fun-time, buy clothes, phones and e-junk, in-between popping into the 24-storey swish blocks of exclusive apartments for drinkies with their mates. My great-grand-daughter asks a question that takes me back: ‘’Great grand-dad, what did West Hampstead use to be like?’’ What can I say? Resident in West Hampstead since 1970 I remember the splendid mixture of homes and businesses, scarlet skies in summer evenings as the sun fell to the west, Victorian terrace houses lining the roads, rented Council housing accommodation and a diverse range of private apartments. That was before the Camden’s Labour Council began its policy of social cleansing in the years after 2012. At this point I wake up. It is still 2015, but London is being changed into a bland confection of characterless apartments. Today the Council I used to be Deputy Leader of, and which in the 70s and 80s could boast of building more council dwellings each year than any other English council (even more than large Midlands and northern city councils), has been betrayed. My anger is not just about a solitary decision taken by a group of degraded councillors playing a perverse kind of Monopoly with our borough. It is the product of a creeping leprosy that is condemning inner London to turn itself into junk apartments for the wealthy few, at the expense of the homes and jobs that up till now have made West Hampstead a genuine, rounded community of all talents and races. I hear rumours on the grapevine. Perhaps they are merely rumours, but where do they start? Perhaps in the city, in the bars where foreign investors meet and plan the next big deal, or among the estate agents (there are over 20 clustered along West End Lane – they must know something is happening). The rumours devastate me. We have already seen a Labour Council trashing the Liddell Road industrial estate and the 150 jobs that went with it to allow an 11-storey tower block of apartments to be built of which only 4 units will be for social housing. Push off you workers! You are not wanted round here. But to follow we have now seen plans for the 156 West End Lane site that will make Liddell Road seem like a workers’ paradise. An excrescence of unsightly housing reaching up to 6 or 8 stories, transforming the elegant streets currently alongside Lymington Road will put the Conservation Area into the shade – to help foreign investors looking for a quick buck. Labour Camden may argue that it is investing the proceeds back into the council and the borough. Apart from being a hollow claim, large areas of the borough will become residential zones for young bankers and City ladies and gents. Labour is giving Camden’s existing residents the bum’s rush. And that is not all! The Library on Dennington Park Road is already being ear-marked for closure. The council calls it a public consultation – but anyone who has been close to local government knows that you have one of those before you go ahead and do the outrageous thing you were going to do anyway. Once closed it becomes a gold-mine. The council-built housing to either side of it and the open space behind it could bring in £30million or £40million from developers who could throw up a large housing block of 12 or 14 floors. The destruction of a book shop, a bike shop, a dentist, bars and restaurants would count for nothing. The synagogue and the elegance of the roads on either side would be dwarfed by the monster. Communities would be destroyed and traditions lost for ever. I can also see more jobs going down Blackburn Road off West End Lane, on top of the loss of 30 jobs at Travis Perkins, as the developers scramble to buy up yards of spare land along railway lines. And where would the proceeds be spent? On facilities for residents? Play areas, drop-ins and tennis courts? No way! Any funds for investment would no doubt be directed to the south of the borough and the lifestyle of West Hampstead destroyed for good. The piece de resistance is still to come, perhaps 4 or 5 years away. The vast parking area at the rear of the O2 centre on Finchley Road has an immense potential for the developers. A large site of 4 or 6 football pitches will be put out to developers, and we will see sky-scrapers of luxury homes, and a fashionable shopping centre boasting its links with Finchley Road stations. I am sorry that my grand-children will have to adjust to the ruination of West Hampstead. Perhaps even more sorry that they will associate the obscenity of housing bubbles and the disposal of community assets with a Labour Council. Its not too late, though, for the local politicians of all parties to come together with the community to defeat the Builders of Blocks. The consequences of not listening to raised voices will degrade the important principle of accountability that has defined Camden’s government for over 51 years. Author Bio: Neil Fletcher was born in Blackpool, taught in Leeds and moved to West Hampstead in 1971. 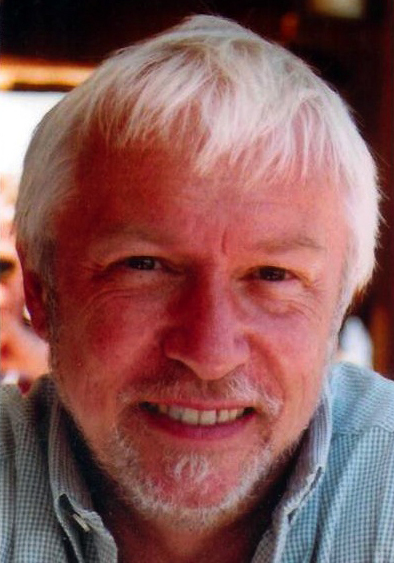 He was a trade union officer, became a Camden councillor (Chair of Building, Works and Services, and Finance Committees, and Deputy Leader of the council) and was also a member of the Inner London Education Committee (ILEA) for 11 years. He was Chair of the Further and Higher Education Committee and then Leader for three years before it was abolished by Margaret Thatcher in 1990. He subsequently became Executive Director (Education, Culture, Libraries, Sport) at the Local Government Association (LGA) and now works as a consultant on education and public services in England as well as in Africa. • FAR from being a battle between residents and the Town Hall over the building of new homes as the headline on Dan Carrier’s July 23 report (New Journal, July 23) implies, this will be the first real test of Camden’s overarching planning directives, building on land adjacent to West End Green Green Conservation Area, Camden’s own building regulations and the newly adopted Neighbourhood Development Plan. The Save West Hampstead “Stop the Blocks!” campaign is clearly not against development that falls within the guidelines that Camden itself has adopted and stringently enforce in other instances. 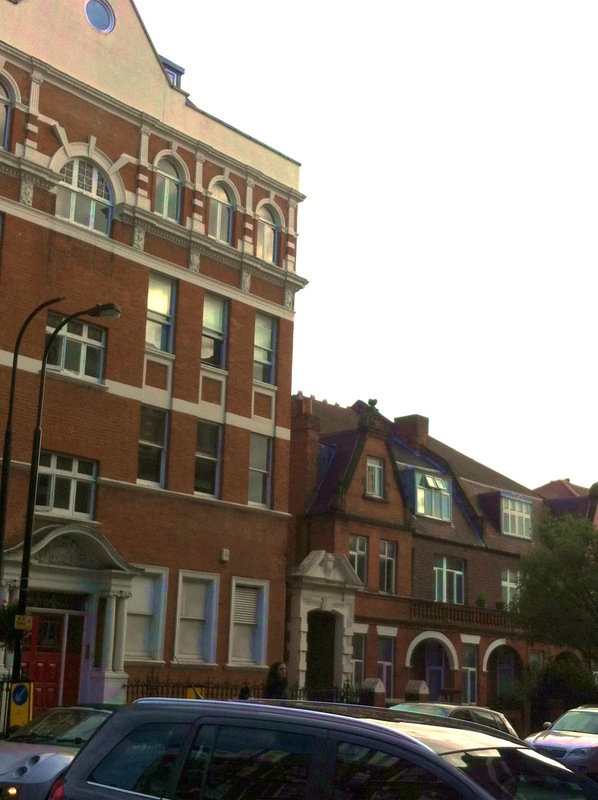 A July 14 meeting at Lymington Road Residents’ Association Hall was filled to capacity, residents from all over West Hampstead opposed this development. One of the many reasons they oppose this brutalistic over-development of blocks at 156 West End Lane is that its height and mass have a negative impact on the adjacent area and it will be an eyesore seen all over West Hampstead, as is the Ballymore development; erected like tombstones to welcome you. Architecture to make your eyes vomit. The rush to push through the proposed plans is a concern for all in the area, especially as the full impact of developments at Ballymore, Iverson Road, Liddell Road, and Maygrove Road on the infrastructure has yet to be evaluated regarding GPs, school places and the sheer volume of residents on the narrow pavements using the three train stations in the morning rush hour for which there are already queues to get into the tube station and on the trains. The cumulative impact of the developments when considered alongside all the others already underway will have an adverse effect on the area and not provide the type of housing needed to satisfy local needs. A2 Dominion will exchange contracts with Camden soon for the purchase of the site, subject to planning permission, a decision which also falls to the council as the vendors. The site is being sold at a give-away price. Camden should know better. Residents are bemused they are having to endure exhibitions and one-to-ones with a PR company working for A2 Dominion to look at proposed plans for a site that Camden still owns, that are in breach of Camden’s own planning regulations and guidelines. I conclude with Camden’s own policies and a few of the objections raised at our community meeting on the 14th and the one-to-one sessions with Lymington Road residents on the 21st which led to the headline: “Neighbours’ anger at plans for 200 homes.” This fell for the illusion being fed by A2 Dominion’s PR firm Instinctif that the development only affects 15 houses on Lymington Road. Residents came away from the one-to-one meeting none the wiser after receiving a variety of answers to the same questions, proving that the event was nothing more than a box-ticking exercise to show that processes have been adhered to; no matter how loosely. West Hampstead in the London Borough of Camden is, like many other boroughs in the city, facing unprecedented levels of ‘redevelopment’ – indeed over-intensive over-development – at the behest of councils operating in tandem with private developers. In rather too many cases, long-standing communities are being destroyed and local public assets being sold-off and handed over to private developers to do with largely as they choose, irrespective of the direct tangible benefits to existing residents, in a single-minded race to build housing and cleverly-named “affordable housing” that is beyond the means of the majority of workers. Camden is no different, having already seen the historic Camden Lock Market and huge swathes of light industrial space in King’s Cross and elsewhere sold-off. West Hampstead, with its multiple railway network interchange and widely touted “village feel” is also the focus of a series of large-scale developments approved by the council in spite of their impact on residents, their businesses and livelihoods and the area’s heritage. Today, the Save West Hampstead “Stop the Blocks!” Campaign publishes its open letter to Camden Council and A2 Dominion, the council’s latest preferred bidder for a site at 156 West End Lane, in an attempt to shine a light on the dubious operation of the council, its representatives and the way in which it seems happy to ignore and overturn its own planning policies in bids to secure short-term profits from the rapid disposal of public assets against the wishes of the very people and communities the council is meant serve. For further information about the campaign, please see the Save West Hampstead “Stop the Blocks!” website at savewesthampstead.wordpress.com, follow us on Twitter, or email us directly at SaveWestHampstead@gmail.com. Balancing the pressures of growth with the sustainability of communities is one of the biggest pressures we face today. In our borough of Camden, as across London, we must plan for tomorrow, provide for today, and not lose sight of the past and our heritage. The public emergence of redevelopment proposals for 156 West End Lane in West Hampstead (the Travis Perkins site) has fundamentally called into question how our elected representatives at Camden Council are trying to tackle this delicate balancing act. The ill-considered plans unveiling themselves before residents in a fast-paced one-horse race to secure the site and planning permission have spurred the formation of our community action group, Save West Hampstead “Stop the Blocks!”, and people across our community are deeply concerned and disturbed by the proposals. Let us be clear – we do not wish to stand in the way of house-building – we want to see more done to provide high-quality and actually affordable homes in our community and we want our elected representatives – and the officers who advise them – to take the lead. What we do not want is for inappropriate developments to be foisted upon us by arbitrary developers, with or without consultation. We do not want our Council and its representatives to sell-off public assets to fund their out of control spending plans or financial mismanagements. We do not want our Council to have the unaccountable ability to selectively set-aside policies they have established to protect and support borough-wide planning. Likewise entities like Travis Perkins, a local employer and server of local retail and tradesman in the community for nearly four decades, should not be held hostage to the vagaries of an inconsistent planning department simply by virtue of the fact that the land they sit on is not owned privately, but by the Council who may deem it desirable to grant themselves and their preferred developer of the moment carte blanche planning consent. What joined-up assessment is being made of the proliferation of developments now taking place in West Hampstead and the cumulative impact they, and other developments under consideration, will have on the area? We have major developments already in construction or in planning all around West End Lane and major concerns over public services, such as schools and healthcare, public transport, public amenity and safety. As is clear from a cursory study of the facts so far, the Council is failing in its duty to plan coherently, strategically and for the benefit of the community. What effort is the council making to ensure that any proposed development at 156 West End Lane does not negatively impact on the Conservation Area which the site adjoins? The much vaunted ‘village feel’ of West Hampstead, as described by the now leader of the council, Sarah Hayward, is too precious to neglect. When it’s gone, it’s gone. We will not let it go without a fight. Why has the Council bungled the ‘sale’ of 156 West End Lane so spectacularly, costing taxpayers so significantly in the process? We all know about the wasteful neglect of the office space above Travis Perkins/Wickes which has lain vacant for years now, costing us thousands every month. Compounded with a mis-managed ‘sale’ process which saw a developer (Mace) appointed and then kicked off the scheme, a beauty parade courting other developers held but then, as we understand it, fudged and then, finally, A2 Dominion appointed and apparently about to sign a contract worth around £5m less to the Council than if it had properly concluded the original bidding opportunity approximately 12 months earlier. This is not astute financial and asset management at a time when Camden residents are already suffering swingeing cuts to public services across the board, including everything from healthcare services to refuse collections to threats of closure of public services such as libraries. Why is it that the Council seems to have forgotten its own adopted policies on employment and supporting established businesses in the borough when considering developments? We have witnessed the scandalous fiasco at Liddell Road with the Council trying to justify closing down local businesses and much needed light industrial space to build an out of scale tower block by using the sop of a new school (in fact, an extension to an already existing school rather than a new school) in a bid to placate the local community that fought hard against the plans. We all know that more school places are needed and the council has a duty to provide them, but they need to be delivered in a joined-up, measured and sustainable way that does not negatively impact the wider community through the imposition of inappropriate developments that do not meet housing requirements of local people and the majority of workers on average London wages. We do not now need Councillors waiving through another set of ill-considered, profit-driven plans for 156 West End Lane just because they own the land and need to generate cash to balance their spending plans. At best this is hypocritical, at worst it requires scrupulous further investigation of the facts to determine quite what lies behind the drive to steamroller through another inappropriate development in West Hampstead. Probity is key and proper judicial scrutiny must be applied. Where have our ward councillors gone? In meetings and discussions to date, we are seeing a worrying back foot shuffle by the members of the council elected to represent West Hampstead residents. They are not at all keen to engage with or even listen to us – apparently on the basis of legal advice to preserve Development Control Committee positions – while simultaneously more than happy to meet with developers. So we are left with no option but to question their priority – is it the party whip (and the diktat to ‘get the consent and bank the cash’ in the short term) or the electorate, the community, and the people that elected them whom they are there to represent? We are a passionate group of concerned residents that have learned from Camden’s mistakes of the near past and are demanding better long-term solutions. Today, we are around 100 people and support for our organisation locally and across the borough is growing faster than we could have hoped. We echo sentiments that ring true across Camden and London, which are seeing an unprecedented growth in grass-roots community groups formed to oppose ill-considered and inappropriate ‘developments’ that do not meet the needs of local communities and which are driven by the short term cash-flow concerns of councils and long-term profit motives of developers aiming to maximise returns from any piece of land they are allowed by short-sighted councils to occupy. Our mission is to ensure proper scrutiny is applied both to the management of public assets and to the people we elect to represent us and provide stewardship for our community. The proposals for 156 West End Lane contravene Camden’s planning policies and threaten to blight a heritage conservation area. Worse, they offer nothing more than the worst possible deal for the taxpayer. Attempts to whitewash the legitimacy of the Council’s approach on the basis the scheme will deliver new housing – which is necessary but not an end in itself – are disingenuous. We are calling for a better solution. We are calling for Camden Council to act as considerate and caring custodians of our community, not cash-chasing property speculators acting fast and loose with public assets that belong to everyone and could be used to benefit the whole community, rather than a private developer and the incumbent Council administration. Councillors and elected representatives are transient, but the communities they leave behind are forced to live with their legacies. There are better ways than the proposals outlined and these need to be explored fully before a decision that will negatively impact the community, the environment and the general amenity of residents while simultaneously failing to provide the type of housing that is so desperately needed. Other options need to be explored and the sooner Camden Council changes course, the better for all concerned in the long term. A version of the following comment was submitted in response the Camden New Journal print edition article, “Neighbours’ anger at plans for 200 homes” in order to correct and clarify the position of Save West Hampstead “Stop the Blocks!”. The article makes no mention of the campaign, misquotes, and fails to include some of the key points conveyed during the telephone interview with the CNJ. At the time of publication of this post, the comment below is yet to appear on the CNJ website. The print edition of this article is titled, “Neighbours’ anger at plans for 200 homes”. The online version instead proclaims, “Council face battle with residents and businesses over West Hampstead development”. 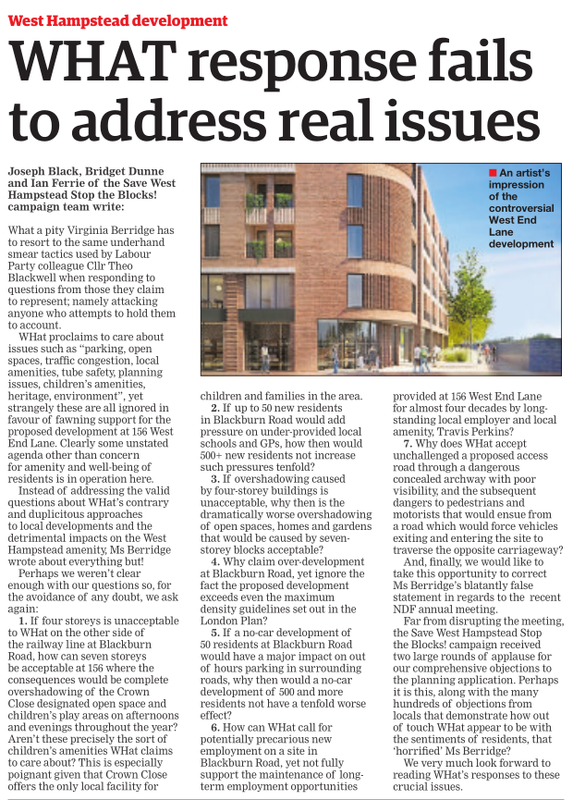 Neither headlines or versions of the article highlight the fact that brief interviews were conducted with members of Save West Hampstead “Stop the Blocks!” campaign, while the first headline is misleading and suggests the group is opposed to house-building, which couldn’t be further from the truth. What the group IS opposed to is the over-intensive over-development of West Hampstead through the creation of housing that is neither in keeping with Camden’s planning regulations nor ‘affordable’ in any realistic sense of the word applicable to ordinary workers. This is a sentiment that rings true across Camden and London as a city, which are both seeing an unprecedented growth in grass-roots community groups formed to oppose ill-considered ‘developments’ that do not meet the needs of local communities and which are driven solely by the short term cash-flow concerns of councils and the long-term profit motives of developers aiming to maximise returns from any piece of land they are allowed by short-sighted councils to occupy. Attempts to portray Save West Hampstead “Stop the Blocks!” as ‘nimbys’ (this article, and George Downton (letters pages)) are also inaccurate and avoid the considerable impacts on the amenity of all residents of the area of a proposal of the mass, scale and density of the one proposed for 156 West End Lane. Lest we forget, West Hampstead has not yet seen the impact of the Ballymore development at ‘West Hampstead Square’, Iverson Road, Liddell Road, and Maygrove Road; nor is there even any consideration of potential future block-building on the O2 car park, Broadhurst Gardens and Blackburn Road among others. We suggest West Hampsteadonians investigate both current and future plans for the area before pre-judging the position of Save West Hampstead “Stop the Blocks!”. Stay Put – ‘Consultation’ or ‘Indoctrination’? Save West Hampstead “Stop the Blocks!” was formed by local residents immediately plans for 156 West End Lane were unveiled in a very low-key manner, completely unbefitting of a proposal of the scale and impact on amenities proposed. Yes, the campaign was founded by residents of Lymington Road, but it has quickly grown to encompass residents from around the area and is supported by the Crediton Hill Residents’ Association, the Lymington Road Residents’ Association, the West End Green Conservation Area Committee, and West Hampstead Gardens & Residents Association, as well as hundreds of residents not part of a specific group. A series of public interest issues were raised with Dan Carrier, specifically referring to the sale of the site with Camden as the owner and broker of the sale, as well as the fact that existing proposals run completely counter to Camden’s own planning guidelines, all considerations that need to be factored in when building on the perimeter of a conservation area, and all rules regarding the replacement of space to an ongoing, viable business. The point was also made that Travis Perkins sustains hundreds of small, independent local businesses who rely on them for their supplies and who, in turn, employ additional people, and that a few high-churn retail units and “start-up” spaces would not make up the employment deficit. West End Lane and its over-inflated rents for retail units already serves as a good example how small, independent businesses and its workers are being driven away. Indeed, an editorial published by the CNJ makes a similar point: Relentless developments are driving our people away. 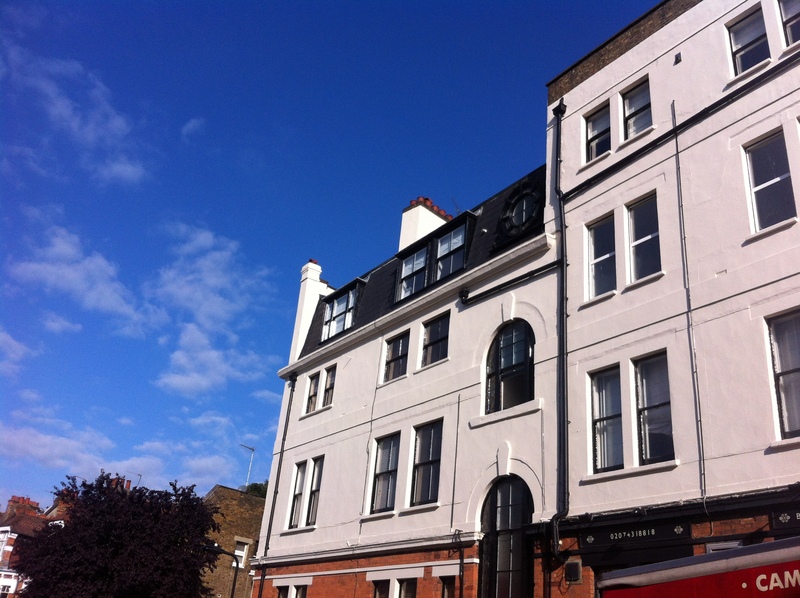 This is the Save West Hampstead blog. Click to visit our website. W.H.A.T. the N.D.F**… on W.H.A.T. the N.D.F***? Follow Save West Hampstead "Stop the Blocks!" Save West Hampstead "Stop the Blocks!" Save West Hampstead, "Stop the Blocks!" Create a free website or blog at WordPress.com.